… but don’t panic if you do. I usually offer myself up willingly to new cities and spend days getting lost: away from the main drags, along fascinating alleyways, following my nose into courtyards and around corners sniffing out hidden gems. Maps stay folded in my pocket, guidebooks stay closed and I use the tallest, most obvious feature on the skyline to guide me back to the start. It’s worked perfectly in every city I’ve ever visited, except two: Berlin, when the winter fog obliterated the TV Tower from sight, and in Cairo’s Islamic quarter; when I was sucked so deep into the Khan El-Khalili’s covered market (in a rip tide of local shoppers and market trader’s trolleys) that the towering minaret of the Sayyidnah Hussein Mosque disappeared from view. Burrowing my way back out would have been great fun if I’d had all the time in the world; but with a useless map, no way to see the sky or any landmarks – and knowing that my flight home would be boarding in two hours – I did start to sweat with the stress of it all. 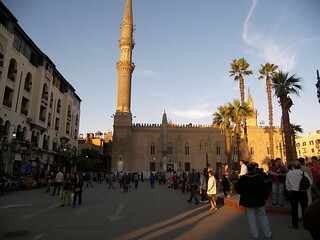 Islamic Cairo is one of those places where, if you’re conscious of time, it’s best to stick to the main streets and the major sights. 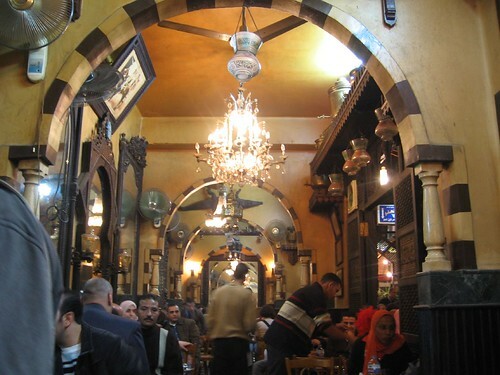 For example: the main souks run off Sharia Al-Muizz street; the main square, called Midan El- Hussein, is a great orientation point and is home to the important Sayyidnah Hussein Mosque; and Fishawis (Cairo’s oldest coffeehouse or ahwa) is located just off Midan El- Hussein. Stop walking and relax: on a bench in Midan El-Hussein, especially if the call to prayer is pouring out from the minarets; in Fishawis smoking sheesha and drinking coffee; or inside a mosque – just check if non-Muslims are permitted inside, then remove your shoes, pay whatever donation is expected and, if your are female, cover your head with the scarves provided. 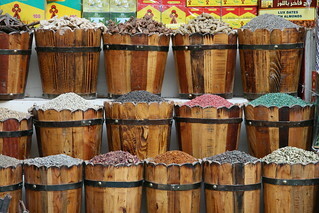 Market traders and touts in the Khan El-Khalili can be persistent. 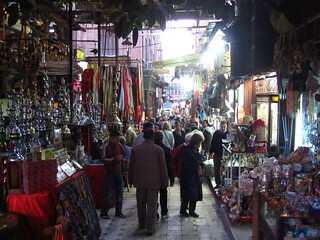 If you’d rather keep to your path along the main streets, decline all offers to visit their workshops or stalls elsewhere within the souk. Say “La’a shocrun (no thank you)” and stay on track. Egypt takes public security very seriously, especially in popular tourist areas such as Cairo’s Khan El-Khalili; so you’ll notice members of the police and the tourist police stationed at intersections around the souk. If you do wind up lost, politely ask one of them for directions by pointing to a photo of Midan El-Hussein (the main square) or Sayyidnah Hussein Mosque (the main mosque) in your guidebook. Say: “fein el (where is ….) 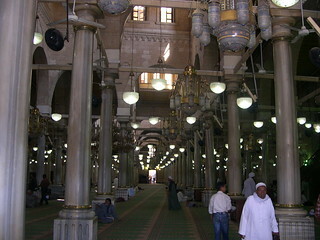 Midan El- Hussein”. Give yourself plenty of time to explore ‘the Khan’ and don’t have any fixed plans to rush off for (i.e. dinner reservations or planes to catch). Then, if you want to, you can get lost to your heart’s content among the maze of medieval streets, market stalls, mosques and cafés that stuff the most famous souk in the Middle East. That way, unlike me, you won’t suffer a single moment of panic during the whole experience.